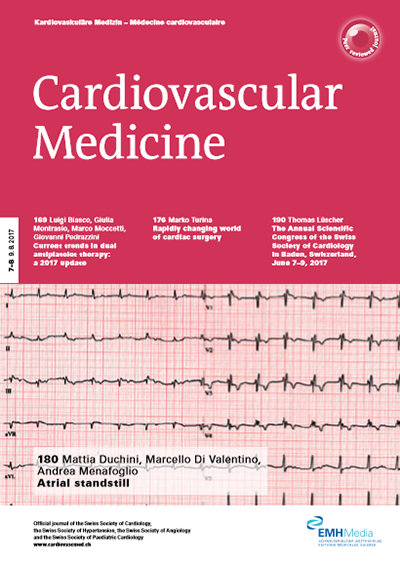 Founded in 1998, Cardiovascular Medicine is the official journal of the Swiss Society of Cardiology, the Swiss Society of Angiology, the Swiss Society of Hypertension, and the Swiss Pediatric Cardiology Society. The journal currently operates under the leadership of the two chief editors, PD Dr. Andreas Flammer and Prof. François Mach, and the two deputy editors, PD Dr. Jan Steffel and Dr. Philippe Meyer, along with the full support of a board of section editors and a well-selected group of national and international experts. With eleven editions per year, this multilingual, peer-reviewed journal has a circulation of over 8,000. Cardiovascular Medicine thus represents one of the most relevant scientific journals published in Switzerland today. The journal’s primary focus is on education and training, each edition including reviews from recognized experts in the field, covering current topics and news pertaining to cardiology, angiology, hypertension, cardiovascular surgery, as well as other related disciplines. These articles are rounded off with in-depth guidelines, the latest developments in the scientific community, as well as clinical case reports. There are also special editions that focus on hot topic issues, as well as summary reports of national conferences, such as the annual meeting of the Swiss Society of Cardiology. As a general principle, both solicited articles and spontaneous submissions are considered for publication, those that are accepted benefitting from a broad readership in Switzerland, owing to the journal’s wide distribution.